Am I one of the few people who are not overly thrilled with the Brian Michael Bendis coming to DC to particularly take over the Superman titles? Specifically distressing is that Superman will relaunch again, again, again with a new issue one. That makes five #1s out there in the world, not counting variant covers. Since the Rebirth relaunch initiative DC Comics has been doing mostly everything right, that is giving the readers what they want. As opposed to Marvel who seem to be giving their readers anything but. Which is why I am none too happy with this because the creators on the Super-books have been doing stellar work and should be allowed to continue. Case in point is the recent Superman issue 40, “Suicide Planet” Part One by James Robinson, Doug Mahnke and Jaime Mendoza with some great covers by Viktor Bogdonavic and Jonboy Meiers. Or “Suicide Planet,” which is it? Superman and son, Superboy, are observing the anniversary of Krypton’s destruction when they discover another planet about to end in much the same way so of course they go there to help in any way that they can. Once there they find a planet of religious zealots who believe it is the divine will of their god Dhermet that if they should die with their planet then so be it. 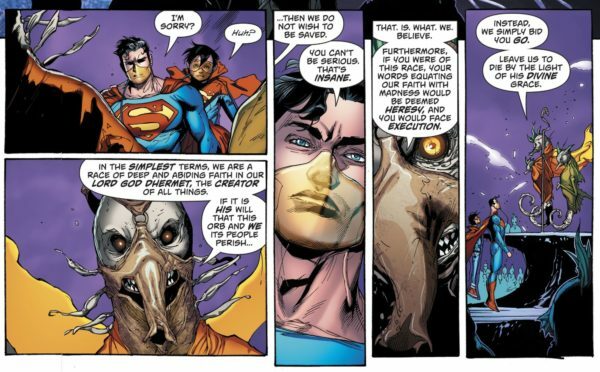 I was shocked when Superman quite plainly said, “No.” Who am I or anyone else to think that someone else’s belief system is “cuckoo for Cocoa Puffs?” Besides the obvious point that it is. My inner Picard was thinking, “Well, ok then. Good luck with that.” While my inner Kirk was thinking, “Personal freedom is great but we will save you in spite of yourselves.” Superman obviously is more Kirk than Picard in that instance. On so many levels, Superman could have gone Picard but he didn’t which is what makes him Superman. Should he have? It’s not like Superman has a Prime Directive. He could have decided to let them be and that also would have been very Superman. Both responses are valid and therein lays the ingenuity of this issue. If you do more than just read it in the 3.725 minutes it takes to read a 21st Century single issue superhero comic you will see that Robinson is going for a Big Picture Superman story, one that could have simultaneous good and bad consequences no matter what choice is decided upon. And it has some genuine funny going on here too: This is why you read Superman, anyone who says that there are no stories to tell with Superman just isn’t trying or they just can’t hack it as a Superman writer. It’s about his supporting cast, the world around him and what it means to have a Superman in it, more often than not Superman isn’t about the Super but the Man. Just like Trek isn’t always about the green alien women, spaceships and ray guns but about why, when given the chance the ray guns are not used. It is however, always about the green alien women. 3… 2… 1… Contact… Is the secret. Hey Kids!! Comics: Have you ever danced with The Devil in the pale moonlight?